The Return of the British Open! The British Open - a classic Racketlon event that was one of the first organised on British soil (in London, April 2003; see vintage report) is returning! Read Keith Lesser's preview below. Still going strong. 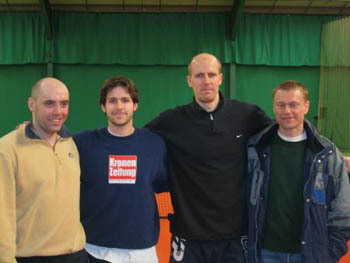 The semifinalists at the first British Open in 2003. Final score: Persson-O'Donnell +9 (tt:21-6 sq:7-21 ba:18-21 te:21-10). A fantastic event is planned following the success already in 2008 of Gidea Park, Cambridge, Bristol & Dudley. The t-shirt / food voucher / prizes gives brilliant value in the entry fee where you are also guaranteed 4 matches per event over the 2 days. A bit of history - It is the 3rd British Open and the first time the event has been hosted since 2004, having been hosted twice at Bushey in 03 & 04 but not since. More importantly it is a good sign of development in the UK since it is the first time we have hosted a 3rd world ranking event since 2004. This is to some extent due to racketlon growing internationally in this period so until recently only one world ranking event per country was permitted. (ed's note: not strictly correct since Sweden has had two every year on the tour so-far. But the agreement to limit the number of world tour events to12 did squeeze out the British Open in 2005 since new countries were showing interest. Since the British and English Opens meant two tour events in the same city - London - one of them had to go.) However, now the tour has a strand called challenger. So we still have The English & Scottish Opens as part of the main tour in August and September with now the British Open as a 3rd World Ranking event in the now extensive British Tour & World Tours thus competitors can improve both their domestic and world rankings at this tournament. Whilst also having fun of course. The event catering for experts down to beginner with a range of categories for all Racketlon enthusiasts. 20 local entries are expected on top all other normal entries from regular and word of mouth newbies alike. With a bit of luck Ashley Watling, World U-16 Champion of 2005 Vienna will also take part. Where would your money be against the Murray brothers of Racketlon? Rhodri and Alexander, having recently appeared on the BBC, would surely give Ashley a run for his money! Ashley is now full time on the Tennis circuit, as a junior, and he would certainly add some press interest locally. Looking forward to your entries and Ray Jordan looks to defend his title from last year although a stronger field is expected. Martin Levens and Jane Cook & Co look to run the event enthusiastically as usual! The above article first appeared on www.racketlon.co.uk and is reproduced here for increased visibility. By courtesy and request of English Racketlon.